Just like in the season opener, a high-scoring first half dissolved into a second-half defensive slugfest. This time, however, Northwestern was the team that entered halftime trailing by two touchdowns, and thus saw its nine-game winning streak snapped Saturday at Ryan Field. After another flawless opening drive for a touchdown — essentially an exact re-run of the opening drive last week against Purdue — the tables quickly turned in the second quarter. Two Wildcats (1-1, 1-0 Big Ten) interceptions, the first by T.J. Green and the second by Clayton Thorson, helped set up three Duke touchdowns to give the Blue Devils (2-0) a 21-7 halftime lead. Almost the entire second half was played in Duke’s half of the field, but both teams’ defenses stiffened and NU was unable to convert on consistently good field position. A first-and-goal sequence led to four consecutive ineffective plays and zero points in the hosts’ most promising opportunity — the first drive of the half — and they never really threatened again. The Cats have not scored a single point in either second half of the season so far. A 8-for-18 rate on third down (and 1-for-5 on fourth down) was largely to blame Saturday, overriding a 381-301 advantage in total yards. Sophomore running back Jeremy Larkin carried 24 times for 121 yards and the team’s lone score in another strong outing, while Thorson struggled at quarterback to the tune of a 22-for-38 for 198 yards stat line. Junior defensive end Joe Gaziano had two crushing sacks on the other side of the ball. 1. Daniel Jones continued his dominance against NU. The Duke quarterback torched the Wildcats through the air in the first half, throwing three touchdown passes. Although he did little in the second half then departed with an apparent arm injury, those three scores proved enough for the Blue Devils. Jones is a solid yet unremarkable quarterback overall, but he’s had NU’s number throughout his three-year career — he totaled 326 all-purpose yards in the two schools’ 2016 meeting and 413 all-purpose yards in last year’s debacle in Durham. 2. 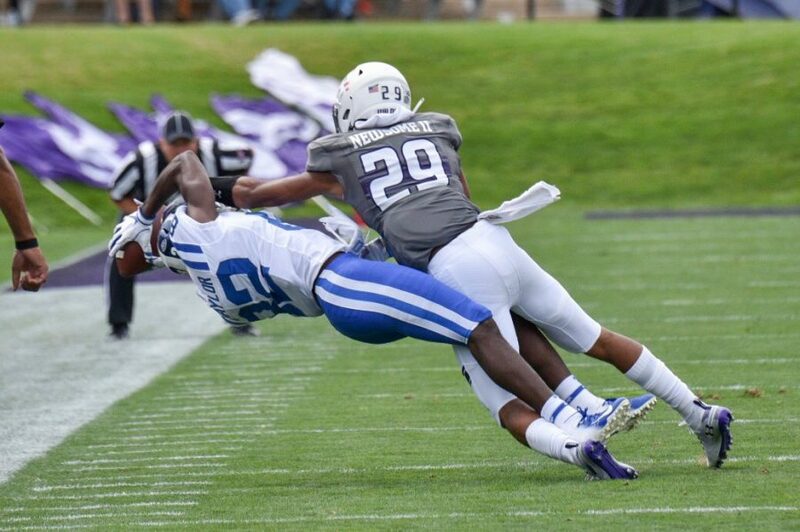 Injuries, Duke front crumple Cats’ offensive line. Losing both starting tackles — senior Blake Hance and sophomore Rashawn Slater — didn’t help, but no combination of linemen seemed to be able to effectively block the Blue Devils’ front seven. NU officially conceded four sacks, but Thorson was running out of time within a second or two on almost every snap in the game’s latter stages. After a strong run late last fall, the offensive line showed it has regressed significantly. 3. Flynn Nagel’s huge game was the silver lining. It was Bennett Skowronek who was expected to be the bigger star among NU’s two returning wide receivers this season, but Nagel has instead stolen the show so far. After a five-catch, 58-yard showing against Purdue, Nagel set career highs with 12 catches and 133 yards Saturday while Skowronek remained a relative non-factor. With superback Cam Green ejected in the first half for targeting, Nagel became the main target in the Cats’ passing game.